To say its been a strange few weeks for me would be an understatement. Excellent, exciting, invigorating…but yeah, strange. While I’ve started this new chapter with Dragon Army and I’m having a blast already, a part of me is also still coming to terms with the fact that the company that I started with Raj Choudhury over a dozen years ago is no longer a part of my life. As I walked around the office on the Saturday after my last day, I started to realize that it was time to close this chapter of my life and start the next. The hardest part of that, as it turns out, is walking away from Raj for the first time in 15 years. I met Raj in college at UNC-Charlotte in 1996. Paired together as roommates, we were the most unlikely of friends. Raj was from England and was one of those people that you envy that truly lives life, always seeking adventure and embracing chaos. I was the opposite, up early for tennis practice, organized and deliberate in what I was doing and always to class on time. Whereas I think Raj made it to a few classes…the entire semester. I can ensure you that he had more fun in his one semester at UNC-Charlotte than I did during my entire time. But we became instant friends. It’s hard not to become friends with Raj as he’s just about the most honest, happy, fun-loving and caring person you could meet. At first we spent untold amounts of time challenging each other in Tetris. And then Geocities was created, allowing people to easily publish websites on this new thing called the Internet, and we shifted our focus there. I’m certain we spent more time in the computer labs than anyone else by a long shot. 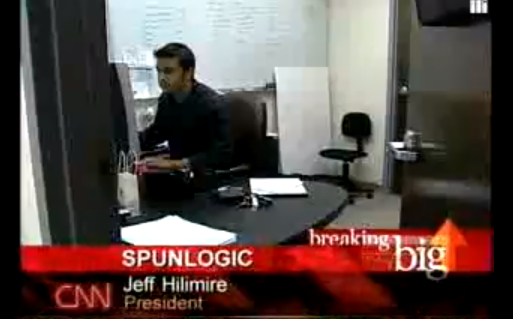 If we weren’t partying or chasing adventures (Raj), or studying or playing tennis (me), we were building websites. Raj would do the creative and I would do the programming. I’ll pause for a moment while people that know us today laugh that we ever had those skills. Lest I bore you with the entire story, which you can read a lot of in this post, we ended up creating our company, NBN Designs, renaming it to Spunlogic, growing it to 75 people before selling it to Engauge in 2008, then both staying on at Engauge until we helped sell it to Publicis Group in 2013. And that was 15 years of our lives. We had to decide early on who was going to “lead” the company. 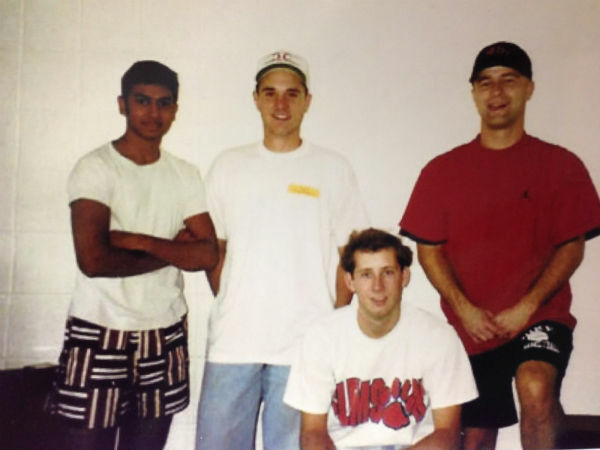 Since both Raj and I had started it, and we had the great fortune to add another amazing partner early on, Danny, we essentially had three founders that could all do the job. But we were smart enough to realize that somebody had to make the final decision and somebody had to focus on CEO-type activities. It was decided that I would step into that role while Raj focused on operations and creative and Danny focused on development. I cannot express what it meant to me to have Raj put his trust in me to lead the company that we had started. He backed me and believed in me, even when I was unsure that I could do the job. Even though we made decisions as a team, it couldn’t have been easy to hand over the reigns of the business you started to someone else and put your faith in them, and I’ll be forever indebted to Raj for having that kind of faith in me. There is no one I know that can work as hard as Raj can. I’ve seen him work 48 hours straight. He is easily the hardest working person I’ve ever met. Even now, he’s juggling his MBA along with an inordinate amount of operations and integration work with the Engauge + Moxie merger. I never could figure out how he does it. – During our one semester together at UNC-Charlotte, Raj came running into our suite one afternoon saying, “You won’t believe it, the RA is so pissed!” and I said, “About what? Did we do something wrong?” Raj looked at me puzzled and said, “No, he’s just pissed.” We went back and forth kind of saying the exact same things, neither of us knowing why the other was confused, until finally Raj said, “I don’t know why people get drunk dude, they just do.” and I said, “Holy crap, he’s drunk, too!” At which point I realized that “pissed” means “drunk” in British-talk. We had a lot of fun with words and phrases like that. – Raj was able to get his mum – that’s British for mom ;) – to fund a period of our early years with her/his credit card. His mum is one of my favorite people in the world and if you get to know his mum and sisters, you start to realize why Raj is the generous and loving person that he is. – Finding out that there was vacated office space near North Lake that had a ton of cubes that we could get. We took 16 massive cubes apart, not knowing what we were doing, and then had to somehow reassemble them back at our Colony Square office. I think that was one of the hardest things we ever had to figure out how to do! – Raj’s painting/mural on the wall of the Colony Square office. It was part beautiful creative genius and part psychedelic drug-induced art. You worked your arse off (another British term I learned) on that, and therefore, I loved it. – Waking you up on the couch in Colony Square (I was there early in the morning…you were still there from the night before) to tell you about the 9/11 crashes, and sitting with you watching on CNN as the events unfolded. – The little office you worked in at Zonolite connected to the server room where you would always have to reconfigure things because you didn’t know what the hell you were doing, but you knew more than the rest of us. You were always amazing at jumping into something you knew nothing about and figuring it out. That’s a great skill and something that will make you successful no matter what you end up doing next. – You teaching me how to snowboard on one of our company trips. Me falling a lot and you patiently helping me figure it out. And the company trips in general, I’m pretty sure that entire concept was something you cooked up. And I remember when we figured out that company cruises were something we could actually afford to do. – Your negotiating skills were a thing of genius. I remember one time at Zonolite we were evaluating vendors for something and you scheduled three of them back to back, and purposely overlapped them so they’d be sitting in the waiting area and see each other. You always could get the best deal for us. – The Halloween parties you threw at Zonolite were epic! One year you set up a haunted maze in the front entrance and you even had a real fortune teller come and tell people’s fortunes. That was probably the best party we ever threw. – The design and build out in Promenade. Dude, that office space is still one of the best in Atlanta. Just yesterday, at Atlanta Tech Village, someone mentioned how incredible that space is. Just another example of taking something you had never done before and just dominating it through pure will and hard work. If/when you guys ever move out of there, take some time to walk around when no one is there and think about what you did. That put us on the map my friend. 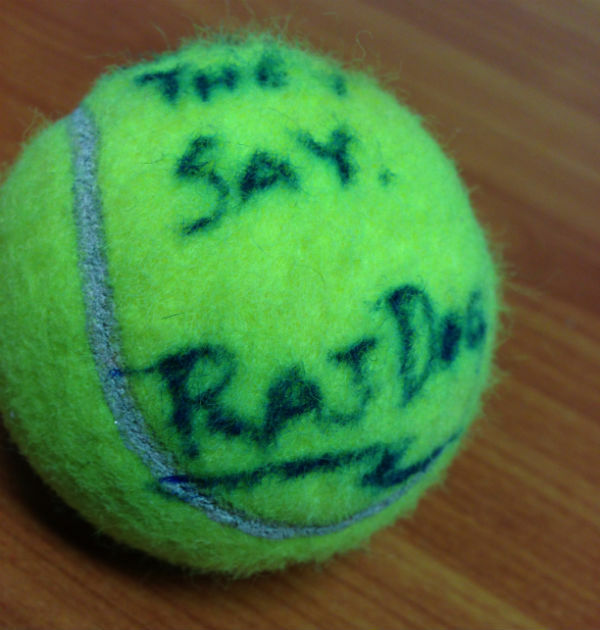 Raj probably doesn’t remember this but when he left UNC-Charlotte, way back in 1996, he gave me a tennis ball that said “To someone who does what they say”. Those words meant so much to me and his thoughtfulness to give something like that to me just shows what an amazing person he is. I have kept that ever since and its one of my most prized possessions. Raj, I was blessed to have met you in college. Had we not shared a love for building websites, none of this would have happened. I’ll be forever indebted to you for your friendship, your faith and trust in me, and for your partnership. I can’t wait to see what you do next and hopefully, one day, we’ll do it again together.